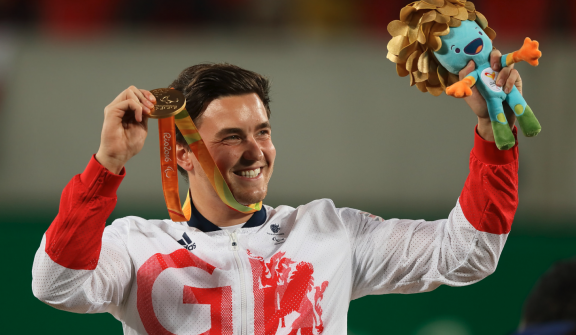 Congratulations to our project Ambassador Gordon Reid on winning both Gold and Silver medals for Team GB in the Men’s Wheelchair Tennis events at the Rio Paralympic Games. Gordon won Gold when beating his doubles partner Alfie Hewett in the Men’s Singles Final 6-2 6-1 on Friday 16th September. The night before the pair had been beaten in the Men’s Doubles Final by the French team in a thrilling match to take the silver medal. After the Single’s final Gordon, who has already won the Australian Open and Wimbledon Single’s titles this year, stated that he had been inspired by compatriot Andy Murray’s gold medal winning performance on the same Rio court a month earlier. Both men have managed the Wimbledon/Rio Gold double.